Our speaker for January is Barbara Rudvalis , owner and operator of Rudvalis Orchids, Inc., located in Carlsbad, California, less than 30 miles north of the San Diego airport. Barbara will speak about hybridizing for cut flowers, how she selects stock for this, the difference between this and what hobby and growers look for in their crosses. She will have actual flower examples instead of pictures and will supply plants for the POS opportunity table. This is a presentation not to be missed by anyone who has interest in Cymbidiums. Rudvalis Orchids has been a major supplier of premium quality commercial cut Cymbidium flowers for over 40 years and potted flowering Cymbidium since the early nineties. Barbara’s late husband, Joe, began the business in the early sixties when he began selecting and hybridizing his own varieties. Joe noticed a lack of early blooming varieties and focused mainly in this area, creating the most stable, high quality and productive standard cut flower Cymbidiums on the market today. 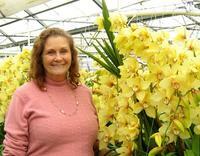 In the late seventies, Barbara began helping Joe breed mini's and intermediate Cymbidiums. Since Joe's passing, Barbara has continued with all aspects of the business. Rudvalis Orchids offers a wide variety of novel Cymbidiums and ships standard, intermediate and miniature sprays (on the stem) plus, six packs of top quality single cut flowers for corsage and exclusive arrangements. The ever changing availability of cut Cymbidium flowers can be found on Barbara’s website at http://www.rudvalisorchids.com or by visiting her nursery by appointment only ((760) 438-2121).